Since I brought you blackberry margarita’s on Friday, I thought it was only appropriate to bring you strawberry scones on a Monday. For me, the beginning of strawberry season is better than Christmas. There is nothing I enjoy more than a basket of fresh strawberries, preferably just picked and still slightly warm from the sun. I can, and will, eat my body weight in fresh strawberries. Oh well, there are worse things I could binge on. 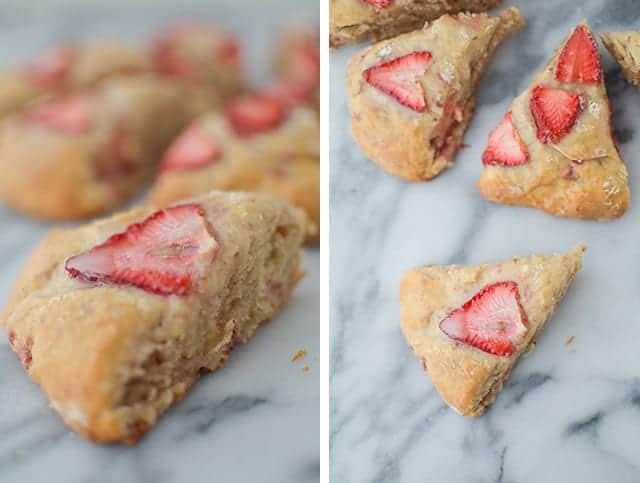 While fresh strawberries are delicious on their own they are ah.maz.ing in these scones. 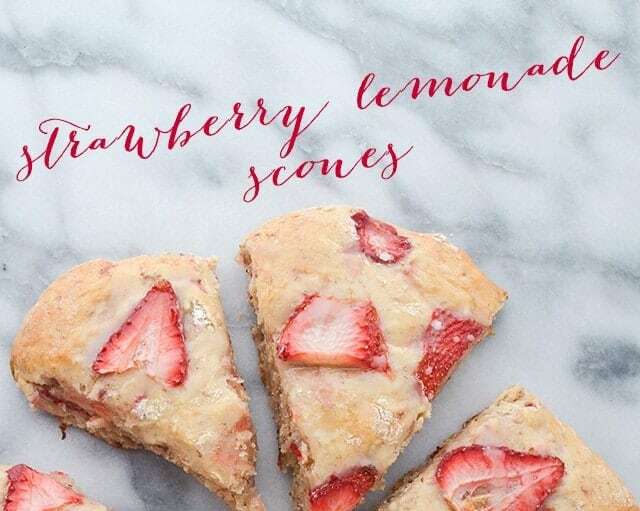 Subtly sweet, buttery scones filled with jeweled strawberries and topped with a perky lemonade glaze. The great thing about scones is that once you’ve made one, you’ve made them all. That’s the perfect beauty of this treat: a little of this, a little of that, the scones pretty much make themselves once you’ve got a few tricks down. 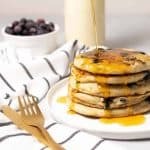 The second trick is not to overmix the batter. Resist the urge to use your food processor or kitchen aid. Use your hands or a pastry cutter to add the butter to the batter and to quickly incorporate the wet ingredients with the dry. Quickly roll out, slice and you’re done! 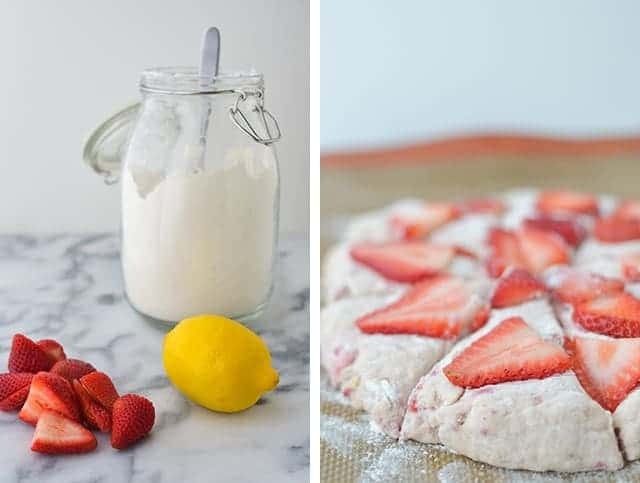 Like we do with most things we bake, consider sharing these with friends, co-workers, family- whoever most needs a strawberry lemonade pick-me-up. Scones are unexpected, thoughtful, and always appreciated. Scones are the anti-cupcake. 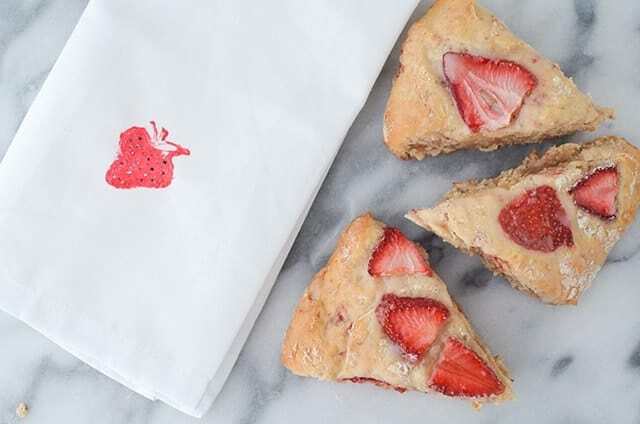 Everyone brings cupcakes, everyone brings brownies.To make these a really over the top gift, I’ve included a quick DIY for my strawberry printed napkins. Cute no? Since mother’s day is right around the corner, I think I will be combining these scones, my fresh strawberry jam, and printed strawberry napkins into a cute “you’re the best, I love you mom” basket. Thankfully, my love for strawberries didn’t fall far from the tree. 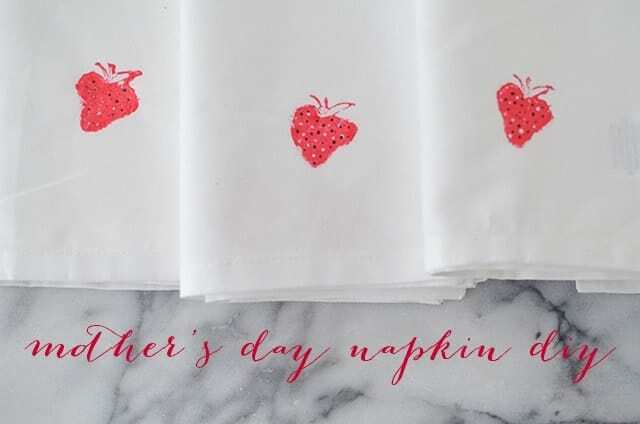 For the napkin DIY you will need plain white napkins (also adorable using flour sack tea towels), red fabric paint, sponge paint brush and a strawberry stamp. How-to: Wash, dry and iron the napkins or tea cloth before using. Then, using a sponge paint brush, paint red fabric paint onto the stamp for even coverage. Place stamp down onto the napkin, press gently and remove. Let dry completely before use. 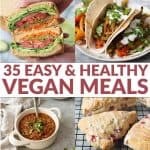 In a small bowl, combine the almond milk and vinegar. In another small bowl, combine the ground flax seed and water. Let both sit for five minutes. In a separate bowl, combine the whole wheat pastry flour, regular flour, baking powder, salt and sugar in a large bowl. Use your hands or a pastry cutter to work in the butter, 1 tbsp. at a time. Add the milk mixture, flax seed mixture, and vanilla extra to the dry ingredients, stirring enough to make a soft dough. Fold in the strawberries. Turn out onto a floured board and knead about 15 times. Roll or pat out into a 12-inch circle, about 1-inch in thickness. Cut into 8 wedges and top with leftover strawberry slices. Place the wedges onto a lined baking sheet (using parchment paper or a silpat) and bake for 20-25 minutes until lightly golden on top. Remove and place on wire baking rack to cool. Make the glaze by whisking together the powdered sugar, lemon juice and zest. Drizzle on scones and serve.